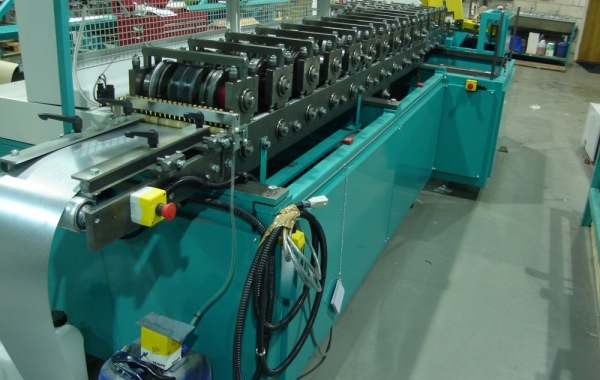 This line of machinery is capable of producing oval seamed Tubular Ducts, in cut lengths up to 10m long, from pre slit-to-width coils of 0.4mm thick galvanised steel, at a rate of 25 m/min less cutting and flaring time, i.e. approximately 20 m/min. The leading end of each duct tube is flared to allow insertion of another length. 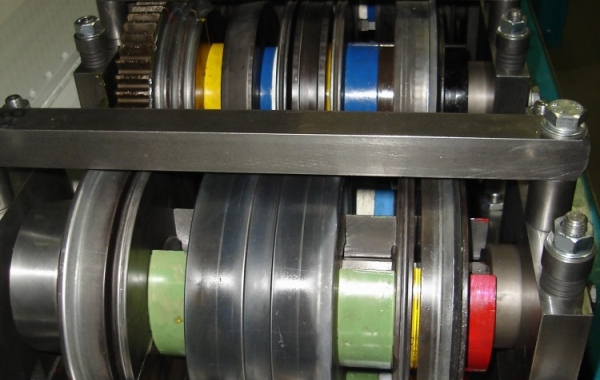 The line can produce three different widths of duct, 90mm,70mm and 43mm. 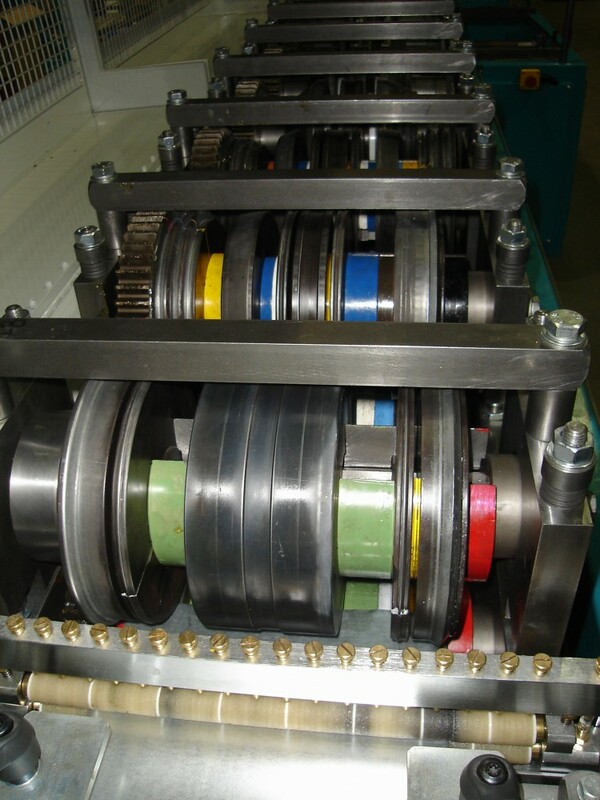 One only new Motorised Single Mandrel De-Coiler. Capacity 2000kgs. Mandrel width 400mm. Maximum o.d. 1500mm. Manual expansion. Loop arm control. This is split into two sections. 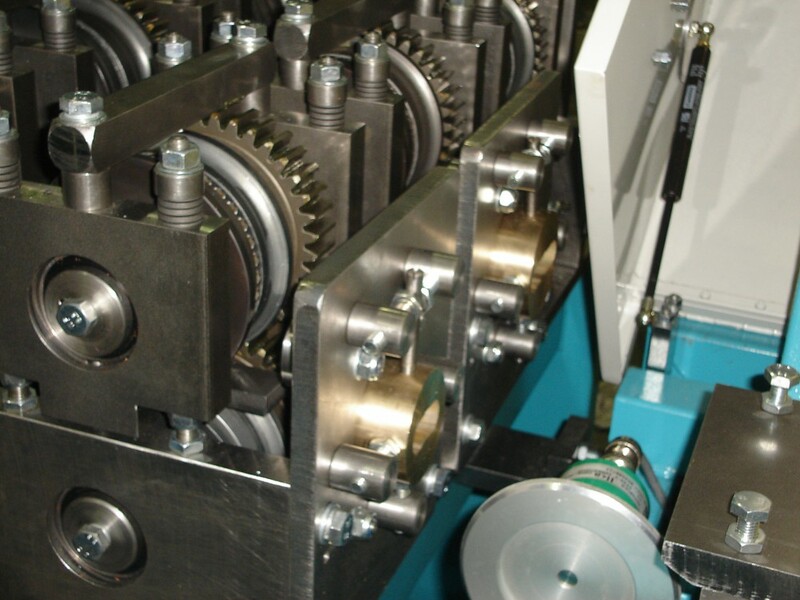 The first section, which is made from one rollforming head, provides the majority of the forming stations and is of the 'fixed sideplate' type. 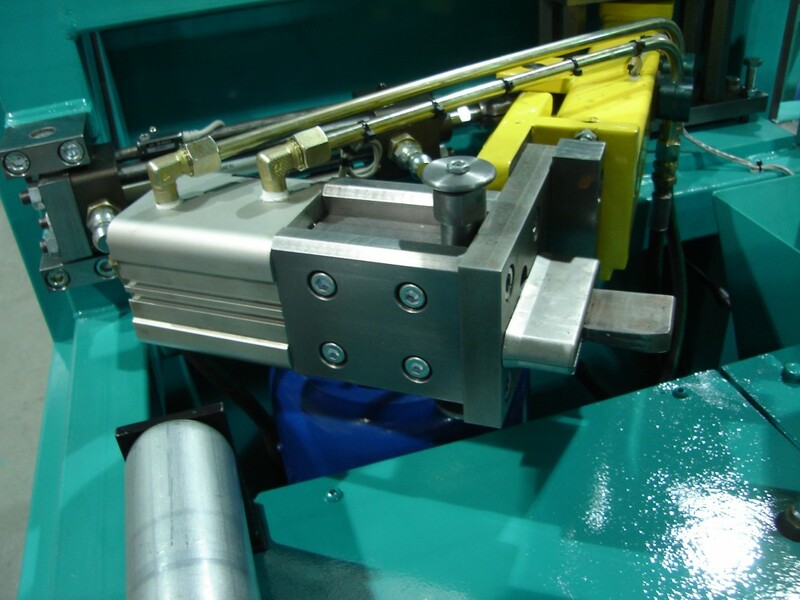 The rollform head is equipped with a split, multi-adjustable roll set, utilising ‘C’ spacers to change both the width of product and position of the stiffening ribs. 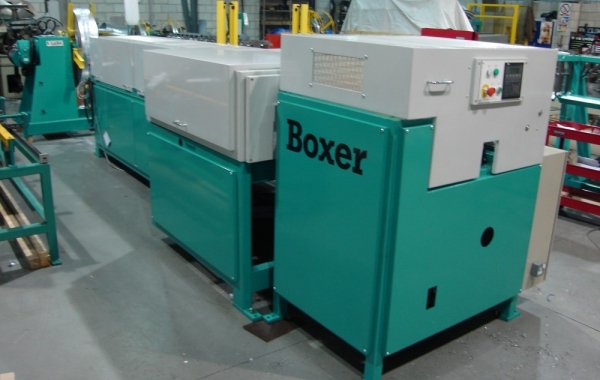 The second section is made up of three separate rollforming heads, one per width, which are set on linear guides and selected by simply pushing to the correct location for the desired product width. 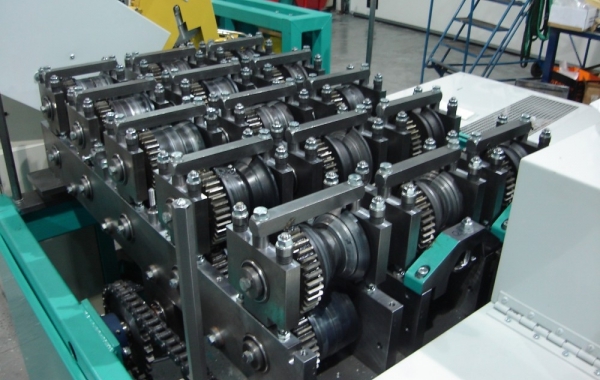 Each of these heads are tooled with an internal arbor, which aids the forming process as the product closes and especially to react against the toothed wheel on the final station for the 'clinch' operation. 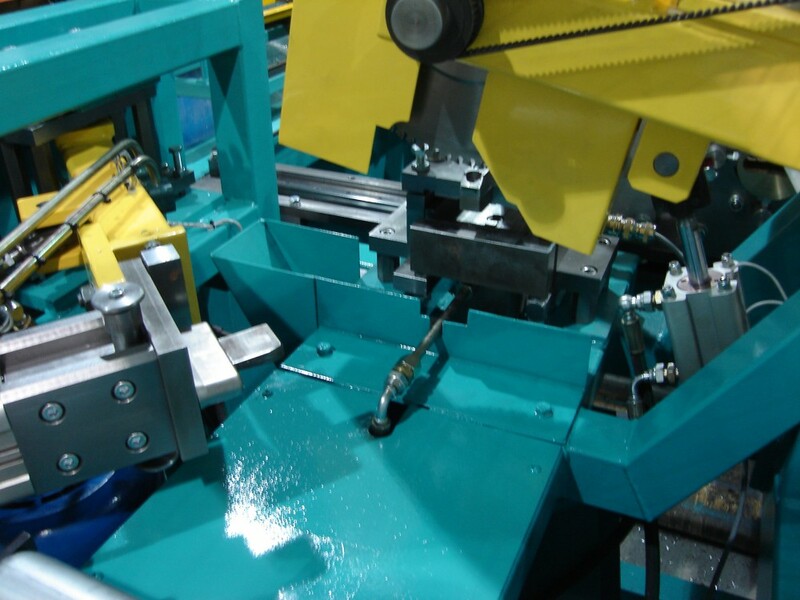 The pivoting saw head with carbide-tipped saw blade is carried by a substantial bearing mounted pivot and is stroked and returned by means of a hydraulic cylinder with flow control valves, operated from the electro hydraulic power pack, in a stroke and return time of approximately 1.5 seconds. 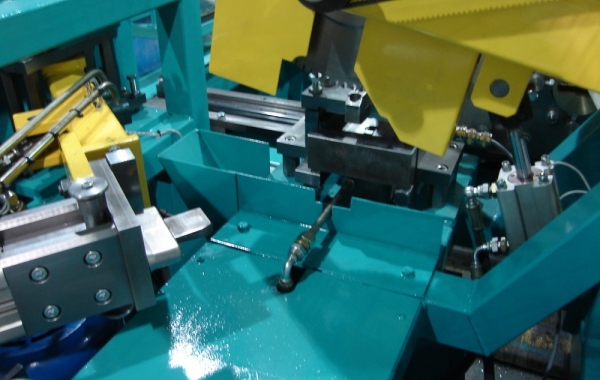 This is preceded by an opening and closing split clamp device, the top jaw being fixed and the bottom jaw on a pivoting arm, with substantial bearing support indexed to the clamp position, by means of a hydraulic cylinder and over-centre locking linkage. 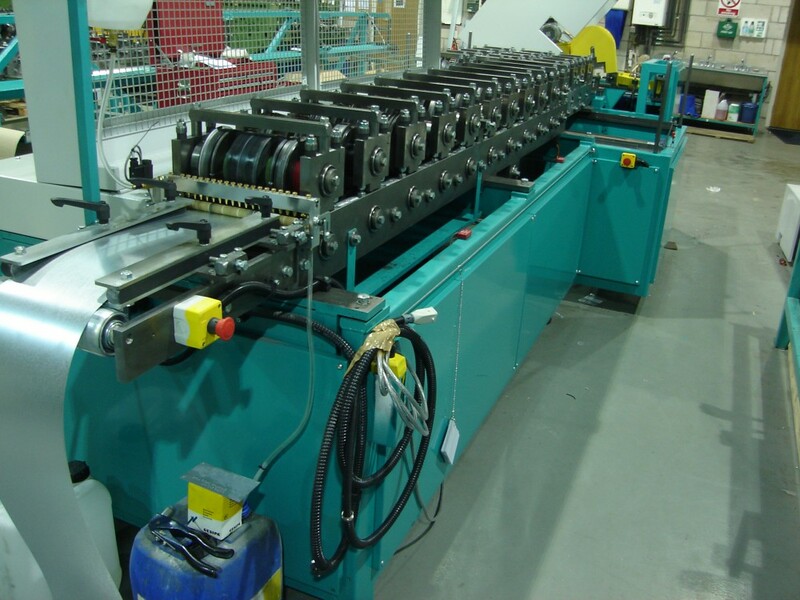 This provides optimum support for both sawing and the following flaring operation for which this clamp also serves. 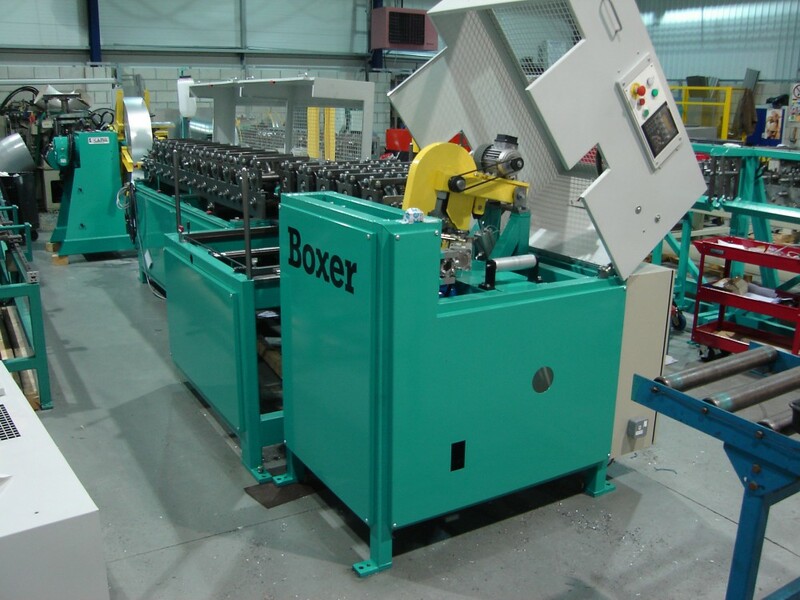 The hydraulically actuated-end flaring head is carried in a common frame with that of the saw and is operated by the common electro hydraulic power pack. 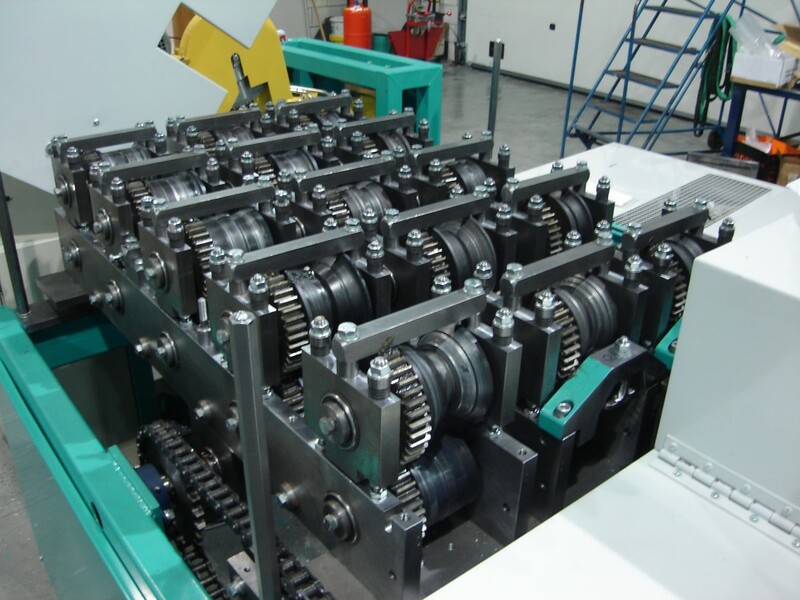 The complete head assembly is pivoted into position by a hydraulic cylinder, with over centre locking linkages, which serve to provide optimum resistance to movement when in the operating position. 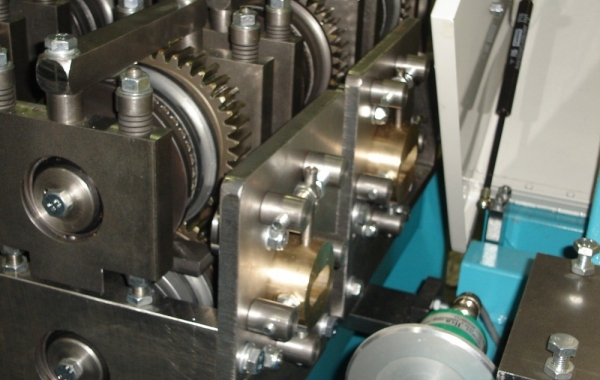 The robust pivoting arm is carried by substantial bearing units, providing positive positioning. The two-piece expanding jaws are held by vertically acting spring plunger pins within the fabricated body. These jaws sandwich a tapered tongue, which is retracted by the hydraulic cylinder to expand the tube. The jaws are readily inter-changeable for differing sizes of duct. 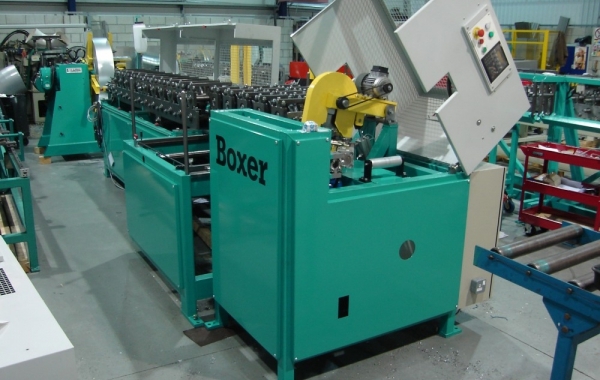 This flaring action is carried out automatically upon immediate completion of the sawing sequence. 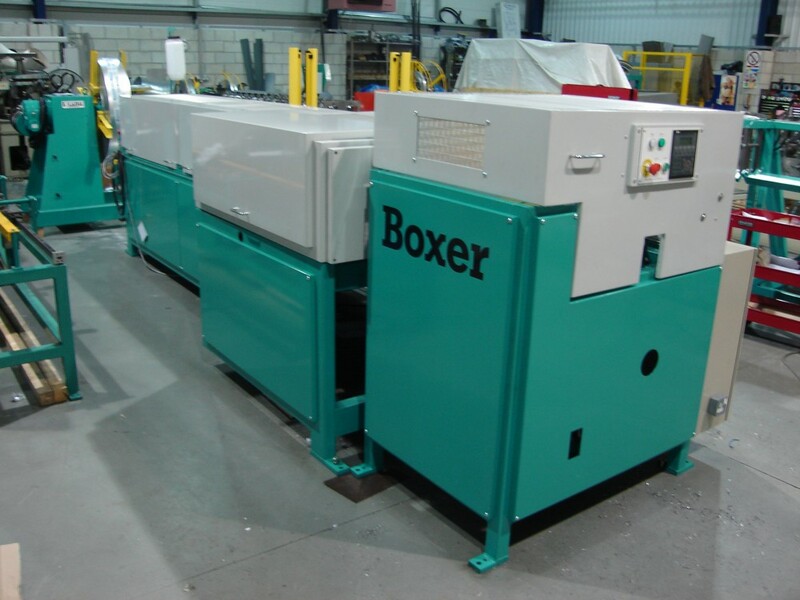 The electrical control cabinet fitted to the side of the Rollforming machine frame carries all necessary electrical hardware, including the fully programmed microprocessor PLC unit, the Rollform and exit roll inverter drives and the dual-channel safety relay. A separate guard-mounted control box carries the simple operator controls consisting of power ‘on’ and ‘off’ push buttons and illumination alongside the operator HMI. This keypad and display unit provides prompted entry of the desired component length and batch quantity, along with the ability to adjust various length related parameters. The screen displays error messages when relevant to simplify fault finding. 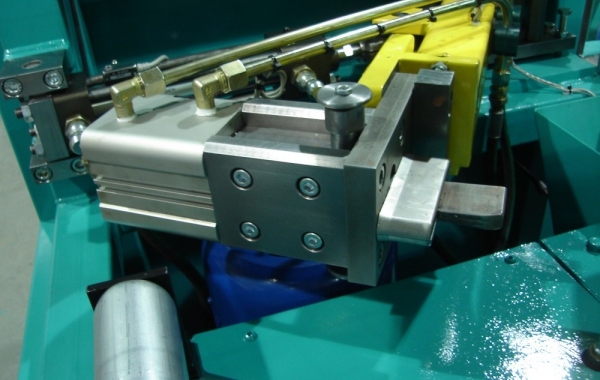 Remote push button stations are provided, one at the infeed end for ‘feed forward’, ‘feed reverse’ control so that feeding of coil is a one-man operation.